Regular servicing and maintance is the key to ensuring long term performance and value from your investment in a power product. 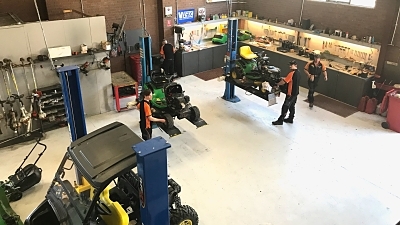 Our premises in Bairnsdale feature a large, modern, full equipped workshop. Our service technicians have over 75 years combined experience in outdoor power equipment, specializing in the diagnosis, test and repair of all small engines. Our service technicians are factory trained and accredited, with access to the latest tools, technology and training to assist in the provision of a comprehensive and professional workshop service. All brands and products sold by Cranes are supported with warranty and on-going service. We will service almost any brand and type of outdoor power equipment, regardless of where it was purchased. Our service divison has earned a reputation over the past forty plus years as a leading service department managed by talented technicians with highly specialised knowledge, skills and training. Copyright © 2019 B and J Crane Pty Ltd. All Rights Reserved. Designed by YMedia.